Lily Windbourn is tired of her controlling family and her ex-boyfriend's inability to move on. Her home town is too small and her family is a mess. Determined to start over, she heads west to Idaho, to a new campus and a new life. Little does she know that they were watching her for a reason. She doesn't know what she was born to become, but they do...and they won't let her go so easily. 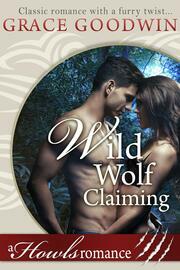 Will she surrender to a new mate...or resist her Wild Wolf Claiming?